1. For each such customer, create a tariff that you want to use to bill the customer and a product. Only one row in rating entry is necessary, with the node “ANY” and the tariff you have created. 2. Now you must make sure that each call made by that customer is tagged as belonging to him. Use the corresponding application on your gateway to handle the call. You can use the PortaOne’s “Session name” application, or create your own. This dial-peer is not adequate for our needs, because any number matching the specification will prefer the port specification, i.e. this dial-peer will match any port. The solution is to use a number-matching scheme that will not match any number. 1. Create customers who will own these accounts. 2. Create accounts with an Account ID identical to the name you entered in the configuration for the applications (abc_ltd and xyz_inc in our example). When your gateway is installed and connected to the Internet via the network interface, it can accept incoming VoIP calls and send them onward. This is fine, assuming that calls are coming in from one of your customers; but potentially anyone on the Internet can send you traffic if they know your gateway’s IP address. This could happen due to a mistake, or it could be done intentionally; in any case, it is not good for your business if this happens. How to prevent this and make sure that only your customers and you yourself are able to use your VoIP network? 1. Set up an access list (ACL) on your gateways so that VoIP traffic will be allowed only from certain IP addresses / subnets. This is a very reliable method. Unfortunately it has one drawback: it is difficult to maintain, since everything is configured on the individual gateways. For example, if you have 12 gateways and you wish to add a new customer, you have to change the ACL 12 times. o Information about authorized gateways is stored in one place, so it is easy to maintain. o The application can include data required for IP-based billing in the call information (so the User-Name attribute will contain an Account ID). o It may be combined with authorization, so that you can also check if a remote gateway is allowed to call a particular number. o You can use more sophisticated ways of identifying a remote gateway. For example, instead of IP address you can use an IP+MAC address combination. 3. An improved version of the previous item is a solution in which all calls to your network arrive to a proxy (such as PortaSIP®) which will take care of call authorization, while your gateways will only accept incoming calls from that proxy. Again, the easiest way to implement this is by using IP authentication on both the proxy and gateways. We assume that you will use either method 2 or 3, i.e. your terminating gateway will authenticate incoming VoIP calls (to check that the remote gateway is allowed to send you traffic). This may be done by sending an authentication request to PortaBilling®, where the User-Name contains an identification of the remote gateway; typically this is an IP address. You can use the Cisco application remote_ip_authenticate.1.1.1.tcl provided as part of the TCL Ware package, or you can purchase an improved version called Advanced Remote Authenticate from PortaOne, Inc. See the configuration guidelines for Cisco gateway below. 1. Create a tariff and a product. Since “Node” and “Access Code” are insignificant for this type of service, set node to “ANY” and leave Access Code blank for the IP-based billing product. 3. Create a customer who will own these accounts. 4. Create accounts with an Account ID identical to the IP address of the remote gateway, and enter cisco as the Service password for this account. (The password cisco has been chosen only for backward compatibility with the Cisco remote_ip_authenticate script. With PortaOne’s “Advanced Remote Authenticate” you can use a different password; just change the list in the application config). Different termination partners often require that you send them numbers in some specific format. For example, your termination partner might require usage of the technical prefix 58901# (so you have to send him 58901#42021234567 instead of 42021234567), while your local phone provider requires that outgoing call numbers be dialed without the country code (so a call to 42021234567 has to be dialed as 21234567). The more partners you have, the more likely it is you will run into these problems with different numbering formats. Of course it is better to use a single numbering format internally. Our recommendation is to use the E.164 format in billing and on your network. An E.164 compliant number is one consisting of <countrycode><areacode><phone#>. Examples of valid E.164 numbers are 42021234567 and 16049876543. The following numbers are not valid E.164 numbers: 6049876543 (NANP format), 01142021234567 (US overseas dialing format), 021234567 (local format). 1. On your customer’s panel, click Services, then click Voice calls. 2. 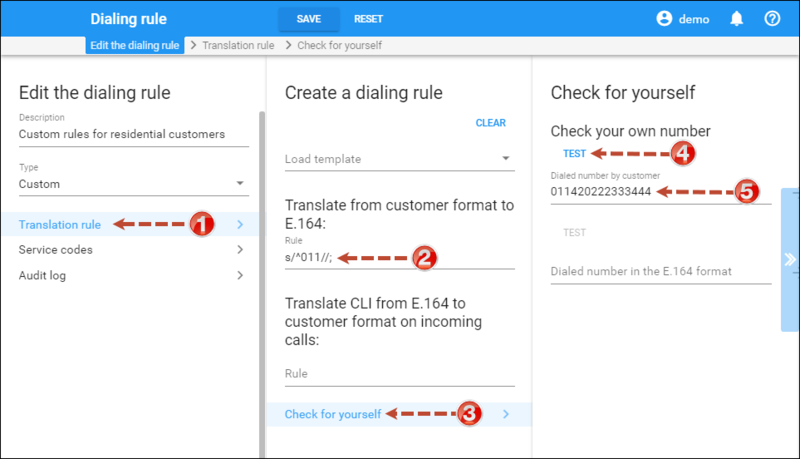 On the Voice calls configuration panel, click Dialing rules. 3. Click the button to edit the dialing rule. 4. Test the translation rule. 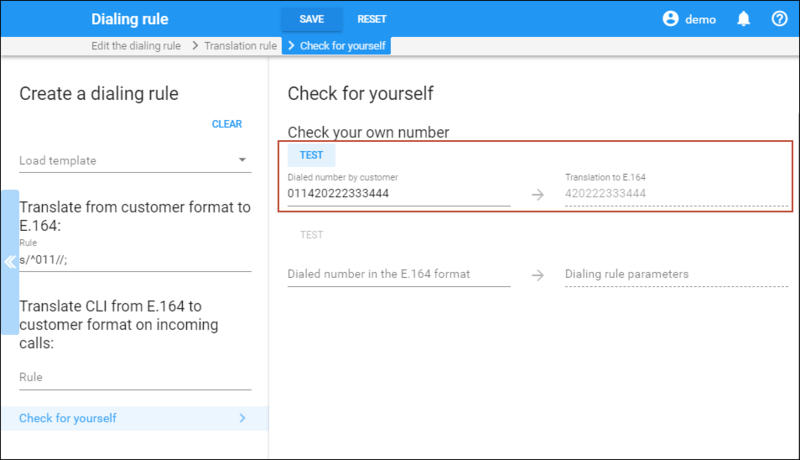 This will enable you to check if your translation rule has the proper syntax, and you can also immediately see if it performs the translation you need. Although matching the connection by IP address is the simplest and error-proof method, in some situations it is not applicable. It may be that your external switch uses routing via an H323 gatekeeper, where the actual IP address of the remote gateway is provided by the remote gatekeeper only during a call attempt. In this case, PortaBilling® is not involved in the routing, and all that is needed is to ensure that these calls are accounted to the correct vendor. To do this, enable the Use tech prefix translation option and enter the tech-prefix in the Tech prefix field of the connection; for example, if you are using appending the tech-prefix 334567# to the phone number when sending a call to the vendor, enter 334567#. NOTE: When a value entered into the CLD Tech Prefix field, this automatically creates proper translation rules for this connection. Matching by tech-prefix takes lower precedence than matching by remote IP. Thus if a call is sent to remote IP 1.2.3.4 with tech-prefix 123#, and you have defined a connection to vendor A with remote IP 1.2.3.4 and a connection to vendor B with tech-prefix 123#, the call will be billed to vendor A. A typical case is one in which a vendor offers you several categories of route quality. Although calls will always go to the same IP address (the vendor’s switch), the termination cost would be different based on the tech-prefix transmitted as a part of the number. In this case, PortaSwitch® must also route the calls properly to the vendor, adding the required tech-prefix. To do this, create multiple connections for the same vendor, for each one of them specify the corresponding tech-prefix in the Tech prefix field (make sure you keep the translation rules, automatically created after that) and use different values in the Gateway ID field. Obviously these connections will have different tariffs associated with them. For example, if the vendor’s proxy address is 5.6.7.8, and tech-prefix 345# offers low-cost routes, while tech-prefix 789# offers premium routes, there would be two connections, with the Remote IP field containing the same value (5.6.7.8), but the Tech prefix field will contain 345# and 789# respectively. First of all, please make sure that both the user agents and SIP<->PSTN gateway are configured for use of the same low-bitrate codec, such as G.723. For other SIP phones or gateways, check the documentation supplied with the device. If you are sure that the codec used for SIP calls is a low-bitrate one (for example, by inspecting the gateway logs), but the quality is still suboptimal, you need to determine where packet loss is occurring in the media path. To do this, you can use standard network tools such as ping, traceroute and the like. Keep in mind that for SIP UA<->PSTN calls the RTP audio stream flows directly between SIP UA and PSTN GW, while for SIP UA<->SIP UA calls the RTP path depends on whether or not an RTP proxy is enabled. If an RTP proxy is not enabled, the RTP flows directly from one SIP UA to another. Otherwise, each RTP packet sent by one UA goes first to the machine running PortaSIP and is then resent from that machine to another SIP UA.